Supervises the Site-Alive, and is in charge of creating administrators, supervising them, customizing the Site-Alive’s web pages. Site-Alive consists of a lot of web pages and when user enters Site-Alive he or she can navigate through them and study the advantages of Site-Alive. Then user goes to registration section and sign up. After registration user will be redirected to administrator section (item 4 of this specification). 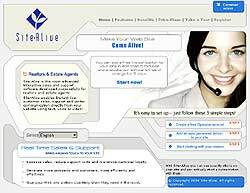 Site-Alive owner supervises all registered administrators. He can see and change administrator data, view administrator’s payments, enable and disable administrator, login as administrator. Site-Alive consists of a lot of web pages and when user enters Site-Alive he or she can navigate through them and study the advantages of Site-Alive. Help section that consist of FAQ and Download pages is also available. Site-Alive’s owner can add/change/remove any web page through super-administration. The process is fast and easy.